With 18 months to go before the start of the 2012 Olympic Games, the route of the men’s and women’s road race is expected to be officially announced this week. Cycling Weekly first published what we believed to be the route in May 2010, which our sources have since confirmed is largely accurate. Of course, some changes can, and probably will, be made late in the day, but the route we published, which heads out into the Surrey Hills, looks like being the venue for one of the opening events of the 2012 Games. 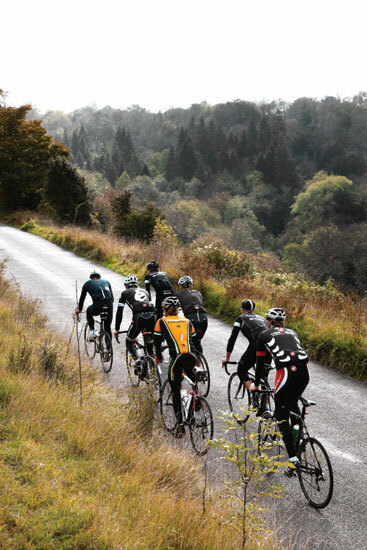 The key section of the route will be the circuit based on the two-mile climb of Box Hill, near Dorking, a hallowed climb well frequented by cyclists. We believe the men’s race is set to cover the 10.5-mile loop nine times, while the women’s race will use the loop just twice. The hill isn’t the toughest in the area – its gradient isn’t enough to make this a race for the climbers, but it does offer a spectacular vantage point for fans. In some sections, the sides of the road are open, offering great views and of course the hope of seeing some attacking racing. Rules dictate that the route for the men’s race must be between 250-280km (about 165 miles), so, broken down, our route takes the riders approximately 40 miles to Box Hill, before they face 90 miles on that circuit, followed by a 30-mile run back to London. The women’s course has to cover between 120-140km. There may also be finishing circuits in London, although this could cause a problem if a break has such a lead that it gets round to the start of the circuit at the same time the bunch arrives (as almost happened at the Worlds last year). Whatever the exact details, the Olympic course will be spectacular, and slightly bizarre. Seeing a 180-rider peloton, with a full convoy behind, sweep through suburban Oxshott and Leatherhead, and through the quite little Surrey towns of Shere and Westcott is a once-in-a-lifetime opportunity, even more special for cyclists who regularly ride these roads. 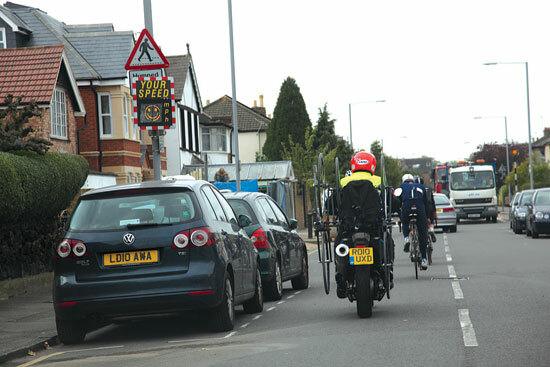 But of course it’s not easy moving the biggest one-day bike race of the year through the built-up towns of South-West London. To see what this might be like, we invited Tom Southam, Yanto Barker and Jonathan Tiernan-Locke to ride part of the route with us. Garmin-Cervélo’s Dan Lloyd (Cervélo Test Team at the time) joined us near Richmond Park to give his verdict on the roads. We set off from Buckingham Palace, up Constitution Hill, left at Hyde Park Corner, before working our way on to the Kings Road, which took us all the way down to Putney and then on to Richmond Park. Since riding the route, we have found out the race is likely to move around the loop in an anti-clockwise direction, heading out via Weybridge and Byfleet, whereas we went to Box Hill via Esher, Oxshott and Leatherhead – essentially riding the route in reverse. No doubt, the bigger headache is for the organisers. On the day of the race, the road is considered the ‘field of play’, meaning no one is allowed on it. So the whole route has to be barriered and closed off completely, a massive logistics operation. The London Organising Committee of the Olympic Games (LOCOG) is due to announce the road race and time trial routes in the next few weeks. Although the route is not yet confirmed and still subject to change, here are a few spots Cycling Weekly recommends for catching the action. Don’t forget, the road race will be one of the few Olympic events that you can see for free. Sections of the route are likely to have grandstands, which you’ll need tickets to get into, but line up along the road and, just like watching the Tour de France, you’ll see the world’s best for nothing. Central London: The finishing straight is likely to feature grandstands requiring tickets to get into (check when tickets go on sale, on Feb 12) but a finishing circuit will offer ample opportunity for spectating. Expect Buckingham Palace, Hyde Park Corner and the Kings Road to all feature. Staple Lane: A tough little climb up on to the North Downs, but it’s unlikely see much action, as it comes so early in the race. Even so, as the first real climb of the day, it could be a launch pad for an early break – if it hasn’t gone already. This should be a good chance to see the peloton cruising along at low speed. Richmond Park: An oasis in west London, Richmond park will be a prime spot come the Olympic road race. The route skirts the park on both the way out, and the way back in, so take a picnic and enjoy the day there. With a bit of luck, the organisers will erect a giant screen somewhere in the park allowing you to keep up with what’s going on in the race. Box Hill: This classic Surrey climb wouldn’t ordinarily hold any fears for a pro rider, but the men’s road race is set to head up here nine times, while the women’s race should ascend it twice. As part of a loop that takes the riders down to Leatherhead before coming back round to Mickleham and up the hill, it will be one of the most densely populated, spectator-wise. The road is a cycling Mecca, heaving with riders every weekend, with its hairpin bends and Alpine-like gradient. However, this stretch of the route remains a major bone of contention. The National Trust (which owns the land) is understandably worried about thousands of spectators trampling on the land where rare orchids grow. Although the route is still to be confirmed, Cycling Weekly understands that Lord Coe has already done the photoshoot on Box Hill, ahead of the announcement and, frankly, the route couldn’t go to that part of the world and not go up Box Hill. Shere: The road race will skirt round Shere, but if you want to watch the riders flash by, soak up the atmosphere and then go and enjoy a nice bite to eat, then this is your place. This beautiful little Surrey village has cafes, restaurant and pubs to suit everyone. The proposed Olympic games road race route might seem to lack any real challenge to a quality Olympic peloton, but I think it will provide the perfect backdrop for a nervous and uncertain race. The course is quite different from the usual championship race formula: it is not set out on a circuit and has no principal difficulty. A World Championship is normally run on laps of a circuit, allowing team managers to know exactly where and how the race can be shaped. On this course, you have the feeling that, without strong control from the sprinters’ teams, it could be a very scrappy race. An overwhelming favourite [in Mark Cavendish] and the unusual composition of the bunch could combine to make the first 30 or so suburban kilometres, on fast, twisting roads out of the city, nervous for those who want to be in charge. I would predict a well strung-out bunch until at least Kingston, where the elastic may finally be allowed to snap. Letting the right break go here could be key. The break needs to be small and weak enough that, on the next sheltered downhill section, the sprinters’ teams can confidently let the gap increase, while saving their strength and getting ready to take the race on later in the day. The ascents of Box Hill should be where hostilities recommence. Depending on how many laps of the climb the organisers choose to use, this will be the place that sprinters could be put on the back foot, although the climb is too easy to simply break anyone. From here, there could be a realistic chance for a committed, hardworking group. The key would be, again, the size and strength of the teams behind that have an interest in the race coming together for a sprint. The run-in back to London seems to suit a chase over any potential breakaways; the roads are fast, wide, and no real springboard seems to exist on what is essentially a 40km false flat. Interestingly, the easier the circuit, the harder it is for any one team to be in control. Without any difficulties, there could be a pack full of jokers left to surprise in the finale. It will take a strong, unified effort and a lot of luck for the race to fall perfectly into a bunch sprint. 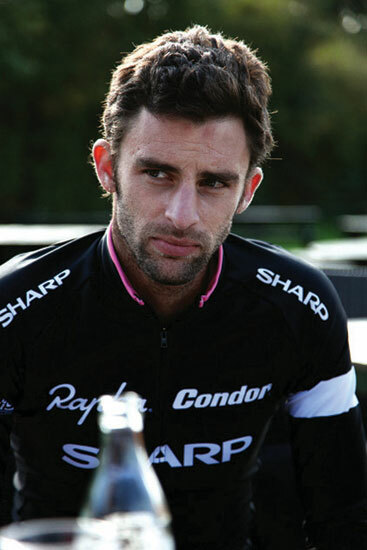 CAVENDISH & COOKE: COULD A BRIT WIN? All eyes will be on Mark Cavendish for the men’s road race, but will it finish with a bunch sprint? The last 60 kilometres look pan-flat, giving plenty of time for a break to be chased down. Also, Box Hill isn’t actually very hard. Nine times up it will cause sprinters a few problems, but there should be enough time for them to get back on if splits do occur. Cav’s main problem will be the number of team-mates he has with him. Places are qualified this year, and GB needs to finish in the top 10 of the World Tour rankings this year in order to qualify maximum places. If they don’t, Cav could be left with just two team-mates in the road race. For the women’s race, the course could actually be too easy for Nicole Cooke to take advantage. The reigning Olympic champion excels on tough courses where her attacking style weeds out the weaker riders. Cooke can sprint, but there are faster sprinters in the women’s peloton; and she will have even fewer team-mates than Cavendish to help her shape the race. Lizzie Armitstead might turn out to be a better bet, even though she isn’t thought to be fast enough yet.